Well, this is it. After 246 issues as bearer of the Flash's crimson and gold uniform, Wally West is officially calling it quits. 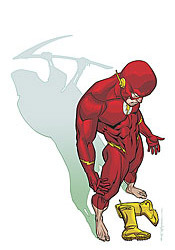 With Barry Allen set to return to the role in a new ongoing series, the only real question this month is whether Wally will live to see the day his mentor resumes his work. Facing a rejuvenated Queen Bee wouldn't normally be cause for much concern, but with his powers on the fritz and his family in trouble, the modern Flash isn't exactly running at full speed. Writer Alan Burnett has drug Wally to the end of his rope. Confused and frustrated by the slow degradation of his powers, furious over the abduction of his children, shaken by his wife's sudden turn for the worse and incensed over what little his super powered friends can do to help, West isn't immediately recognizable. His temper may be excusable, considering the severity of the situation, but as a parting shot it leaves a bad taste in my mouth. As a former Teen Titan and longtime member of the Justice League, Wally must have faced similarly trying times in the past. Watching his emotional breakdown, lashing out at his friends in a crisis, whining and complaining rather than immediately confronting the problem, is one of the most awkward farewells I can imagine. Even stranger is the inconsequential way the whole ball of wax is resolved. West and company spend more time bemoaning their predicament than they do actually resolving it, so when it's all said and done I was left wondering if things were ever really as bad as they seemed. Burnett did a great job of building hurdle after hurdle for Wally to deal with, but the blowoff is so brief and matter-of-fact that it nearly spoils the entire ride. Carlo Barberi, J. Calafiore and Andre Coelho split the artwork duties, resulting in a book that looks like an afterthought, fired off to satiate longtime readers and nothing more. I won't pretend to know which artist was responsible for which portion of the issue, but the constantly shifting style and quality of the artwork is blatant and distracting. One moment Wally and company seem vibrant and three-dimensional, the next they're flat and stoic. The lack of visual continuity is distracting and disturbing; it often removed me from the moment and explained that the conclusion of this series was nowhere near as much of a priority as the launch of its successor. As the culmination of Wally's career, this issue left a lot to be desired. For all his efforts to the contrary, Alan Burnett never convinced me that this adventure was any different from the hundreds that had come before, which in turn makes Wally's decision to call it a career at its conclusion difficult to comprehend. It's less like he's chosen this for himself and more like he's been elbowed out of the way to make room for the next big event. Even longtime readers won't find much to celebrate here; skip it. It isn't an ending so much as it is a discontinuation.